Thanksgiving has come and gone, but the winter holiday season has just begun! 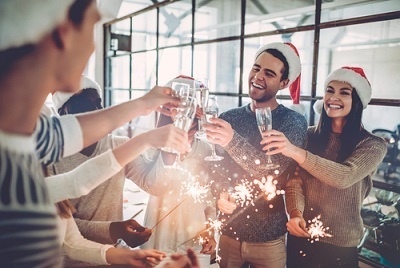 If you’re ready to bring the holiday spirit into the workplace, here are some creative ways to brighten everyone’s day without spending your entire paycheck. There are dozens of organizations across the country that look for charitable individuals who will adopt a family for the holidays, so why not get your office together to help a family in need? Typically, the organization will assign a family to you and your group and provide you with a list of items they would like for the holidays. You can encourage your office to pool some money together, then send a few people out to get the gifts. Not only does it bring everyone together, but it helps the community, too! Whether you have 5 coworkers or 50, making small treat bags will brighten anyone’s day. It doesn’t have to be anything crazy, but homemade cookies or a trail-mix packaged in festive wrapping could be enough to turn someone’s whole day around and get them into the holiday spirit. If your office is small enough, you could even write personalized notes to your coworkers to sweeten the surprise. Ugly sweater contests are a fun way to get everyone together for a laugh. Plus, who doesn’t love to get cozy at work? Whether the prize is bragging rights or a gift card to a local restaurant, everyone loves to dress up and get into the spirit of holidays, so this is a super easy way to celebrate. If your office doesn’t already have some sort of recognition wall, now is a perfect time to create one! You can easily boost morale and bring holiday spirit to your office space by designating a wall for people to post positive comments about their coworkers and bosses, or simply write about something they are thankful for during the holidays. Either way, this is a totally free means of bringing positive energy and cheer to the average workday. Who says holidays can’t be a little competitive? Try getting your office, or even just the people who sit around you, to compete to see who has the best decorating skills when it comes to their desk space. This is a great way to brighten up the plain cubicle you spend your days in, and it will give everyone something to talk about! A new job opportunity can be the greatest gift of all during the holiday season. Unwrap a world of possibilities by visiting our website!